The Purpose of MOPS is to encourage, equip and develop every mother of preschoolers to realize her potential as a woman, mother and leader in the name of Jesus Christ. I drive into the carpark....and notice the impeccably groomed Assistant Coordinator walking in carrying a tray of homecooked goodies... I can’t help it, my mind runs off on a tangent.... “Why don’t I have time to bake anymore? Isn’t she looking lovely, so nicely dressed, hair done in a trendy style, high heels.....the last time I wore high heels was the day we dressed up in hats and heels at MOPS...my chubby armed toddler had done the bolt for the door, and my attempt to chase saw me doing the splits! Now there are some movements one should never attempt after having babies !! I was, ahhhh, less than graceful. .. hmmm where was I? Yes, there I go Lord comparing myself again! Please forgive me. Please accept what I have to give, sometimes I just feel like the dirty little toenail on this body of Christ, and all those other toes are sooooo much better..... sigh. I’d better get inside, there’s so much to cover today.... we seriously need to do some fundraising to get to Conference this year..... double sigh. Oh there’s our mentor arriving...she waves in my direction with a cheeky grin. I respond....and head in the door. The mentor gives a great devotion from 1 Peter 4:10 Each one should use whatever gift he has received to serve others, faithfully administering God’s grace in its various forms, that speaks to my core....did she know what I was feeling? How did she read me so well....? We pray... “Oh dear Lord, help us today...direct our thoughts and give us the wisdom we need to minister to the mums who come through our door. Help us to work form our areas of strength, to use what we have to serve. Lord we thank you for calling us to serve in this way, we trust you will provide what we need and ask that you equip us for effective Leadership. We thank you for each precious person on this team, and the gifts they share with this MOPS group. We pray that you would help us to get as many of our Leaders to The Australasian MOPS Conference as possible, please supply the means Lord. We need your discernment as we plan and organise our fundraising. In your name we pray, Amen.” The devotion time of our meetings are always like a breath of fresh air! I pull out my notes for the meeting, Fundraising! Hmmmm any ideas??? The Australasian Conference (22nd to the 24th of October 2010) is fast approaching! I encourage you to do whatever you can to come to the Australasian Conference! To soak up His presence in fellowship with 100’s of MOPS Leaders from NZ, all over Australia, PNG and Australasia! Ooooh it gives me chills! I am sure by now that you are off and running for the year... MOPS calendars printed and distributed, Term one mostly organised. It seems that everywhere I go at the moment I’m being bombarded with messages of “space”! Were they there last year? Did I just not notice them? Our theme for the year is everywhere at the moment. I wonder...are you allowing God the space he needs with your MOPS group? Are you allowing God the space he needs with you? Are you allowing space within your day to day to meet with Him? I got a timely reminder of this on Sunday, when the Pastor shared a message on S.P.A.C.E. · Sin I need to confess? · Promise I need to claim? · Action I need to take? · Commitment I need to make? · Example I need to follow? The MOPS Experience equips women for the joys and challenges of their lives as mums. One key factor in the MOPS Experience is the relationships built within a group. Time and time again, MOPS mums share that the friends they make in MOPS are significant for this season of their life and on into their future. God created us for relationship! It’s one of the defining parts of being human. However, when you become a mum, all your relationships change. It’s like you have landed on a different planet—Planet Mum—and the relationships on Planet Mum don’t look like the ones on your previous planet. Your relationship with yourself is different—you are a mum! Your relationship with your husband, girlfriends, extended family, community and God have all changed. Many of these changes are positive, some are not. Even positive change requires adjustments on your part. 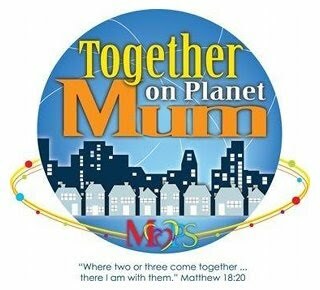 During the 2010 MOPS year, we will explore how to thrive in relationships Together on Planet Mum. 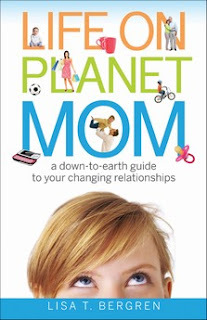 The theme book for 2010 is Life on Planet Mum: A Down to Earth Guide to Your Changing Relationships by Lisa T. Bergren. The book is part of the MOPS International Membership benefit. All the mums and Mentors in your group will want to be equipped with this resource as together they learn to navigate the relationships on Planet Mum. The Together on Planet Mum curriculum DVD. It provides ready-to-use content for MOPS group, to simplify your planning for the year. Many groups use the curriculum DVD to supplement local speakers, so the mums in their group benefit from high quality speakers offering solid content related to the MOPS theme. As you plan your MOPS year with this emphasis on relationships, many pertinent topics can be included. Start with the changing relationships from self to girlfriends, marriage, family, extended family, community and God. Other topics can include conflict, safe/unsafe relationships, siblings, long-distance, virtual (internet) and more. The foundation of being Together on Planet Mum is that God is with us and we are created for relationship with him and each other. We are created to “do life” together. This is definitely true for us as both mums and leaders. The more we draw together in community, the better we are able to thrive as women and mums. And in MOPS leadership, we are better together than individually, which is why the emphasis in MOPS leadership is working together on a team. Share your ideas for implementing the theme and download theme graphics at http://www.mops.org.au Visit the Leaders’ Web site regularly throughout year for updated information on implementing the theme in your MOPS group. Information about MOPS (Mothers Of Preschoolers) and the reasons why you will want to start a MOPS group in your church. Some photos from Regional Training Day - "Paper Bag Princess"
Attendees working on a training activity during the morning. Sorry for the delay in posting these! In addition to the active verbs that describe the ministry of MOPS, our mission statement clarifies our focus on the three distinct roles of a mother of preschoolers. First of all, she is a woman and we address and embrace the distinct characteristics of her as a woman - she is female, a daughter and possibly a wife. Secondly, she is a mother, whether she came into motherhood through biological, adoptive or a blended family situation. And she is a leader with a sphere of influence in her home, community and world. This view of our audience means that while we begin our interaction with her during the preschool season of her mothering, MOPS can offer a lifelong touch on her life as we speak into all her seasons as a woman, mother and leader. Finally, two foundational principles in our mission statement. We are focused on every mother of preschoolers and our ministry operates in the name of Jesus Christ. Ministry that embraces every one and every kind of mother of preschoolers – with varying life situations and backgrounds - single, married, urban, suburban, working, stay-at-home, teen, older. And MOPS is a Christian ministry that seeks to honour Jesus and his purposes. Our arms of ministry reach wide to embrace women and mums at various places on their spiritual journeys, but ultimately we exist to draw mums into a relationship with Jesus Christ.